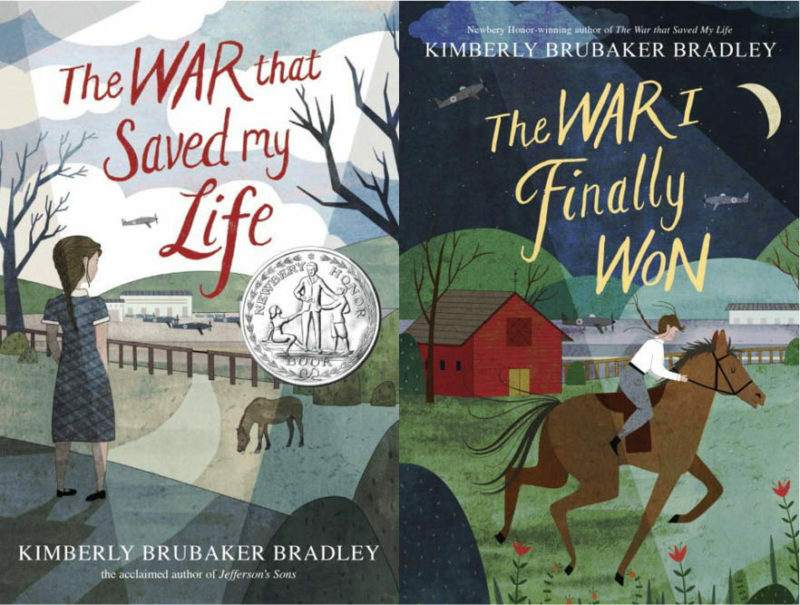 I have a close cousin whose book recommendations have never steered me wrong, so when a few months ago she was singing the praises of a recent middle-grade novel, The War that Saved My Life by Kimberly Brubaker Bradley, I knew I had to add it to my to-read list. I finally got to it (and its sequel, The War I Finally Won) this winter, and was glad to find my cousin’s record unmarred. These books are deep and difficult, but scattered with moments of beauty and grace even in the midst of suffering. The first book opens with an introduction to ten-year-old Ada and six-year-old Jamie, living in extreme poverty in London’s East End at the very beginning of World War II. Ada does as much as she can to shelter Jamie from the cruelty of their mother, a vindictive woman who keeps Ada locked in their third-floor flat. Ada was born with a clubfoot, and, despite the availability at that time of corrective surgery, chose not to pay for it and instead blames Ada for her disability. Ada is ashamed, deeply traumatized, and woefully under-educated. She and Jamie do not even know their own last name or their real ages. Thankfully, early in the book Ada and Jamie are evacuated out of London into the country. Ada has never seen grass before. She and Jamie are placed with a woman named Susan and are plunged headlong into extreme cultural and emotional reeducation, lasting the length of both books and eliciting a huge amount of empathy from at least one invested reader (me). There are so many things Ada and Jamie don’t know that even regular conversation is a challenge. Terms like “churchyard,” “soup,” and “sheets” have no meaning to them, and Ada’s pride and fear often result in her trying to muddle through on her own. In one instance, Susan mentions to Ada that they might be able to visit a specialist doctor to see if he can perform an operation on her clubfoot. Ada nods through the whole conversation, then goes out to visit Susan’s pony, Butter. It’s only hours later that she gathers the courage to ask Susan what an “operation” is. (In a more comical instance, Susan has been reading aloud from a fairy tale book and Ada asks her why the British haven’t rounded up all the dragons roaming around England to help in the fight against Hitler.) But the books aren’t really about Ada’s intellectual growth; they’re primarily the story of her stepping into real childhood for the first time, and recovering from physical and emotional abuse. She learns what it means to be taken care of. How to receive gifts. How to play and truly smile. How to love and be loved, and how to live in courage instead of fear. As the reader, your heart just goes out to this girl through the painful and beautiful emotional journey of these two books. Ada struggles so much with receiving love, having lived most of her life thinking she was dirty and unworthy. It’s beautiful to see her relationship with Susan grow, and watch her form deep and true friendships with others in their village. I appreciated the unique perspective that Ada’s voice represents here. It’s been a long time since I’ve read a book with a young first-person narrator in such emotional turmoil. I like not having a perfect character on the page in front of me, and those times when Ada is rude or unfeeling have new depth when the reader understands what’s going on in her heart and mind. The choice to set the story at the beginning of World War II and conclude it before wrapping up everything in bow is also unusual in children’s books, I think. Especially in the second book, characters from a wide variety of economic and social backgrounds are featured, and it was interesting to see the conflict through their eyes. I think the representation of a character with a disability is also huge, and very impactful for many readers who don’t see themselves on the pages of stories. Any reader with physical differences or struggles that set them aside from their peers can surely relate to Ada’s frustration with her “bad foot” and also her determination not to let it define her. Ada and Jamie’s history is hard, and their life with Susan is not simple and easy, either. These books are chock-full with important but difficult themes, so I’d encourage parents to save these for older readers. Read along with them, if you want. Deep middle-grade fiction like Bradley’s is my favorite kind to experience, even as an adult reader. I’m thankful my cousin recommended these; I’ll be holding Ada with me for a long time. Laura Peterson believes that every house in the world should have either a window seat or a porch swing. With the agenda the author has unapologetically put in this story, I am disappointed to see it recommended here. Especially when there are so many other beautiful books to choose from. Any good piece of art is a symphony of themes. I believe that where those themes are truthful, they will reflect the Kingdom of God. Very occasionally we find that an artist who is hostile to the Kingdom will nonetheless produce art that is so truthful that their symphony proclaims the Kingdom, despite dissonant minor themes. Story Warren usually passes over these works, but Laura found KBB’s books so edifying that I decided to share them. We did our best to emphasize that these are difficult books that should be for older readers. Thanks for engaging thoughtfully and with discernment, and for allowing us to be part of the process. Thank you for your review. My two older children (12 and 10 at the time)and I, listened to these books on audio, I agree with the review, there are tough situations to hear about. But they are very thought provoking and allow children to see history of the time and of human nature exposed. Life isn’t all good and to be sheltered from the bad is not reality. It gives them a sense of thankfulness for the way their lives are in comparison. Thank you for this review — I will be looking these up now.